Coal generation has been routed in the latest capacity market auction, with nearly 2.8GW dropping out before it cleared at a record low price of £6/kW. 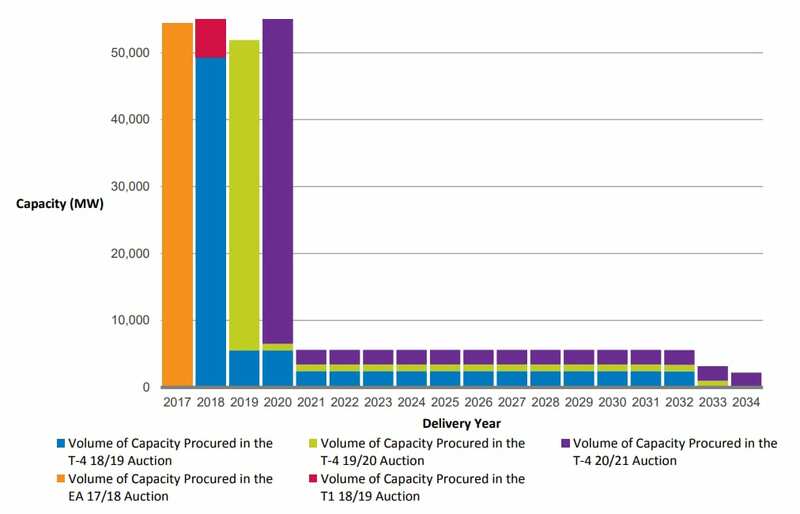 Eggborough power station, the first unit at Fiddler’s Ferry and the fourth unit at Drax were all casualties in the year-ahead (T-1) auction for delivery in 2018/19. West Burton A was the only coal-fired unit to win a contract. Following its failure to secure an agreement, Eggborough Power has confirmed it will close its coal plant once it has fulfilled its outstanding commitments. Out of the almost 10.7GW of capacity to enter the auction, contracts were awarded to around 5.8GW. They overwhelmingly went to existing generation, although new build generation also secured agreements totalling 640MW. 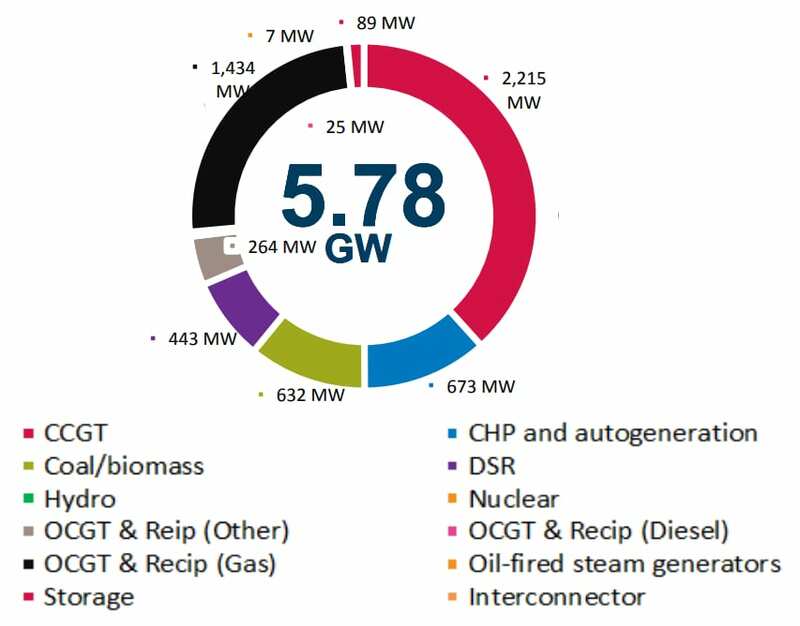 Combined-cycle gas turbines (CCGTs) were the biggest winners (2.2GW) followed by open-cycle gas turbines (OCGTs) and reciprocating engines in second (1.7GW). More than 740MW of OCGTs and reciprocating engines were unable to secure agreements. Known diesel-fired reciprocating engines won 24MW but lost out on 29MW. Barry (221MW) was the only CCGT to exit. 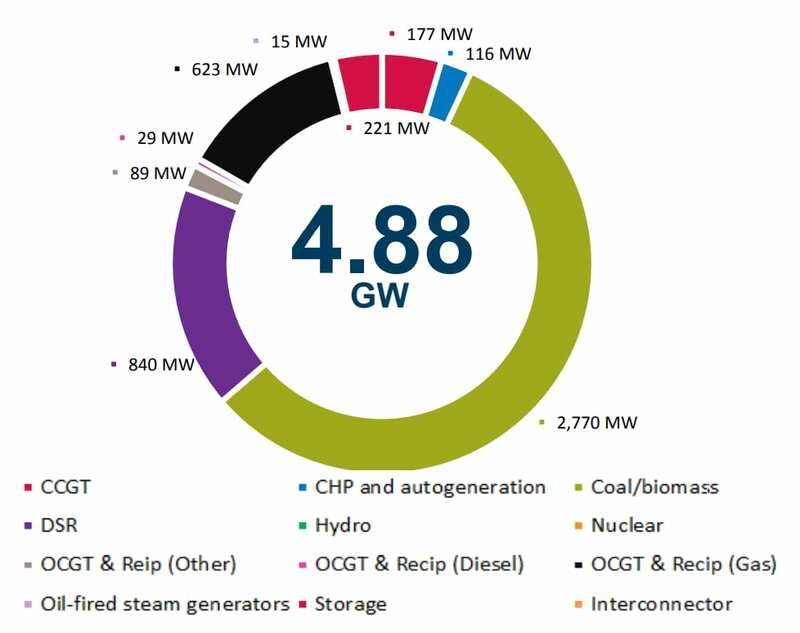 Of the nearly 1.3GW of demand-side response which entered, just 443MW secured agreements. 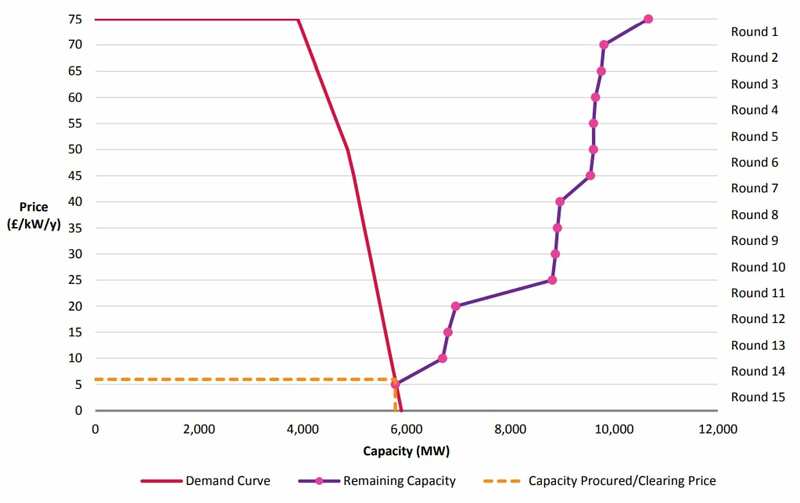 After BEIS slashed the de-rating factor for shorter range batteries ahead of the auction, storage won 89MW of contracts but missed out on 177MW. Responding to the results, Energy and Climate Intelligence Unit energy analyst Jonathan Marshall, said: “Already on the ropes, Eggborough missing out on a capacity market contract was the final straw for this once-great power station. “The terminal decline of coal power is coming at the right time when ever-cheaper renewables are able to fill in the gap, and concerns about air pollution spread around the country,” he added. James Court, head of policy and external affairs at the Renewable Energy Association, criticised the government for subsidising fossil fuels at a time when it is also blocking access to subsidies for renewable technologies such onshore wind and solar. “The government has confirmed that there will be no new spending on renewable power beyond 2021 and there is a significant lack of clarity around the future of renewable heat and transport fuels,” he argued. “No long-term carbon price has been assigned, yet the government is happy to directly financially support gas and diesel projects.